Most employers would tell you today that one of their main challenges is finding employees with suitable skills. Then they change that a bit and they say, “Forget the suitable skills; finding people and that is it. There are simply no people to be hired”. A number also complain that they get no applications for the posts they advertise. So let us put skills to the side – not that they are not important for an employer – and look at developments in the Maltese labour market through a set of numbers that I have extracted from the Labour Force Survey published by the National Statistics Office. I have taken the 2008, 2013, 2017 and 2018 data. The data for the first three years is revised data (revised by the NSO), while the 2018 data is subject to revisions, as is normally the case. I picked up these years in order to have five-year gaps. The fact the first three years were election years is totally irrelevant. Jobs are created as a result of decisions taken well before persons are actually employed. A decision may be taken today by an entrepreneur which could have an impact on employment in a year’s or two years’ time. Or a new legislation may be introduced in Malta or elsewhere which could create a new activity locally or would make us lose a sector that has been thriving here. However, this would not happen immediately as the full impact is felt after a couple of years. So we cannot look at this in a narrow- minded fashion. If we did, we would be demonstrating a crass ignorance of how the labour market dynamics work. The table below reproduces the numbers obtainable form the Labour Force Survey. I purposely chose Q1 (first quarter) to achieve consistency in the four years. The numbers do tell an interesting story. The main one is something that has been highlighted various times. The growth in the labour market is mainly due to two factors: the influx of foreign labour and the increase in the activity rate of females in the labour market. The influx of foreign labour resulted from a lack of suitable skills in certain sectors, an unwillingness of Maltese persons to undertake a certain type of work for low wages and foreigners hoping to make a living here as their country was and may still be going through a difficult patch. The dimension of the influx of foreign labour is best seen from the number of total number of persons aged 15 years and over. Between the first quarter of 2008 and the first quarter of 2019, it increased by just under 55,00 persons. This happened at a time when the Maltese population was not increasing by that amount. This in turn contributed to an increase of nearly 60,000 of the employed population. Moreover, the male activity rate had been fairly stable for a number of years. This has now moved up to 83 per cent, again thanks to the influx of foreign workers. The increase in the activity rates of females has long been coming. We first started to see glimpses of it in the first half of the 1990s, when the increase in employment was in the main attributable to an increase in the number of females working. If one were to look up the newspapers of the time, one would also note an ongoing debate on the appropriateness or otherwise of mothers remaining in the labour market. Obviously today we take it for granted. Still it is very significant that the female activity rate increased by nearly 50 per cent over a 10-year span. Most of the other data is fairly stable. For example, average wages increased by approximately €2,700 between 2008 and 2013 and by another approximately€2,600 between 2013 and 2018. The changes in the age distribution of the employed population reflects the increase in the female activity rate, as those females that had initially taken the decision to remain working after maternity have now reached 55 years and more. 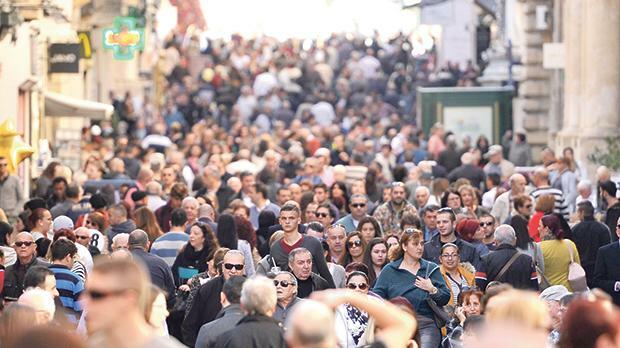 The decrease in the percentage of the persons aged 15 to 34 years reflects an ageing Maltese population and the drive to encourage young persons to remain in education after the age of 16. Another interesting set of data is the main occupation of employed persons. There were some sectors, which over a 10-year period remained stable or even experienced a decrease. There were others that increased significantly. For example, the number of those categorised as professionals nearly doubled over a 10-year span. Those categorised as managers increased by 79 per cent and those categorised as service and sales workers increased by 85 per cent in the same period. Where do we go from here? The Maltese labour market is very dynamic and will continue to evolve over time. There are indications that the influx of foreign workers may have dampened slightly the increase in average salaries. It needs to be seen whether this is sustainable or not. Likewise it needs to be seen whether the influx of foreign labour is sustainable or not, in all respects. We have come to the stage where we need to take a view of which direction we wish to push our economy. Now is a good time to do such an evaluation, as any decision we take will take a number of years to have its full effect. In the meantime, the labour market dynamics need to be continued to be evaluated and understood.